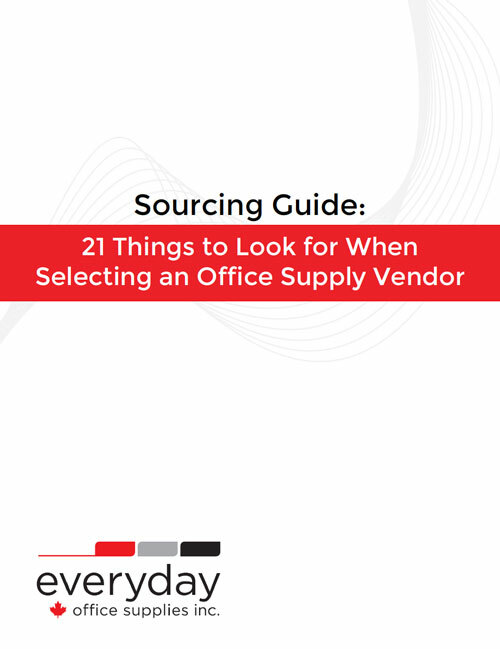 In our most recent post, Every Day Office Supplies shared top tips for selecting an office supply vendor to help our customers and prospects ensure product availability while managing costs. Favourable invoice and payment terms are critical because they affect a firm’s ability to manage its accounts payable and its cash flow. Before they select a vendor, they need to make sure their payment terms suit their firms’ cash flow. What payment terms does the vendor offer? Do customers pay upon receipt, when the order is placed or once a month? Look for payment terms of at least 30 days and identify the late payment penalties in case of unexpected circumstances. Can the vendor provide invoices and accept a variety of payment methods? A good office supply vendor should be able to invoice for an individual order or monthly for all orders company-wide. Increasingly, vendors invoice electronically and accept online payments (e.g. Interac, PayPal), credit cards and cheques. If a customer wants to return or exchange a product, does the office supply vendor have guidelines or restrictions? For example, most vendors accept 30-day returns provided the product is in its original, unopened packaging. On most computers, tablets and eReaders, many have a 14-day policy. Before ordering accessories, equipment and office furniture, it important to clarify the return and exchange policy as they can vary widely product to product and vendor to vendor. Clarify and define how quickly the vendor will replace damaged items and deliver new products. As well, find out if the vendor offers extended warranties or guarantees beyond the manufacturer’s standard offerings. It’s also important to clarify the process for returning, exchanging and/or repairing products that are covered under the manufacturers’ warranty. Will the vendor handle the entire process on its customer’s behalf or will the customer have to deal directly with the manufacturer? Who will cover the shipping costs and is there going to be an exchange or restocking fee? Vendors typically offer commercial customers additional services such as dedicated account managers who develop long-term relationships with customers and are committed to resolving issues as quickly and effectively as possible. They will also understand their customers’ unique requirements and deliver on them. Reconsider working with a vendor that expects customers to connect through a general inquiry phone number or email address as it is likely to be more time-consuming and frustrating. 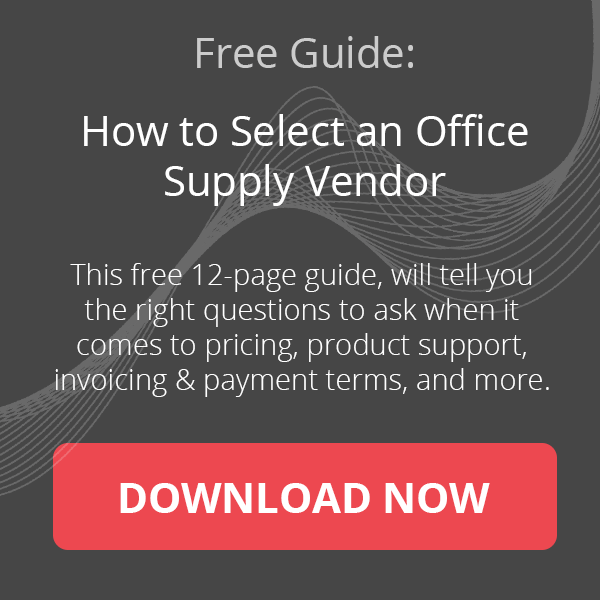 To help customers manage costs and improve satisfaction levels, office supply vendors are subject matter experts who can identify opportunities such as remanufactured toners, generic products and more. An experienced, astute vendor’s complementary office supply audits can save its customers 20 to 30% by identifying purchase patterns and inventory levels, then recommending changes pertaining to quantities, brands/generic products and more. Increasingly, companies expect their suppliers’ values and commitments to corporate responsibility to reflect their own. Due diligence is required to ensure alignment. For example, if a firm is committed to supporting local entrepreneurs and women-owned businesses, they need to know that independent vendors, particularly those that operate exclusively online, are often able to compete with the large chains on price as well as personal service. They may also be more nimble and flexible with lower overhead and marketing costs and fewer, less entrenched processes. Everyday Office Supplies, which is a 100% Canadian- and woman-owned online office supply and furniture company, carries over 50,00 office products and furniture. We guarantee competitive prices and provide free next-day delivery with no minimum order sizes. Contact us today to book a free office supply audit and consultation. It could save your firm 20 to 30% on your office supply and related expenses.